One day I asked a congregation if they without fail read the Word every day, and was horrified that no one (not even the pastor) raised a hand. So I made a habit of asking congregations and individuals “Do you read your Bible every day without fail?” When professing Christians offered their sad and pathetic excuses, I would ask them if they fed their stomachs daily. Then I would ask, “Which comes first — your Bible or your belly?” and let their conscience do its duty. How about you? Do you love God enough to give Him a few minutes each day to speak to you? 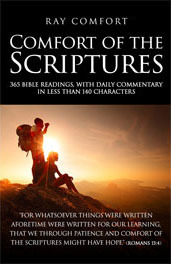 To help you discipline yourself we carved out a 140-character commentary and added it to 365 daily readings of the entire Bible — in chronological order. As your servants, we laid out your daily meal, and we added a small after-dinner mint for you to chew over.